Designing and decorating a home may be easy for some people, but for others even picking the right paint color is a challenge. When you are decorating your home, there are many things you have to think about, from the furniture you have to the colors of decorations you have collected over the years. People are beginning to get a lot more bold with their decorations, creating color combinations that most people never thought of. Some people decorate with no common theme at all. The best thing about decorating, is that you can honestly decorate any way you want. But there are some colors schemes and decorating tips you can follow to create a room that looks as though it came straight out of a Better Homes & Gardens. With these decorating tips, and a bold and beautiful paint job from JC Toland Painting, you can create a room that you are truly proud of. In this blog we will give you some tips to decorating and creating a unique color scheme. Today we are going to focus on the living room—looking at bold room colors and the decorations to go with it. While there are many different blue shades and hues that can be used for the walls of your living room, most blue look good with similar decoration colors. But we will go over a few different styles that you can choose from your living room. Gold is one accent color that looks great in most blue rooms. Gold lamps, wall art, centerpieces, and picture frames can take a blue room and add an elegance and charm. This accent color can stand out against dark blue walls or add a classy touch to baby blue room. White is also a great accent in blue rooms. It can allow the room to look a little simpler but also add style to the look of the living room. White couches are often paired with blue walls, creating a clean and rich look, making the blue stand out. White tables and wall decorations can also make a statement against the dark blue walls. While simpler and more neutral colors like gold, white, black, and brown can enhance the look of a blue room, you can also add many other colors to a blue room to create unique and creative looks. Chartreuse can look great against a blue wall that is more of a teal color, adding a contrast that is different. Reds, maroons, and pinks are also great mixes with blue walls. These colors can add a different tone and draw the eye to different areas of the room. 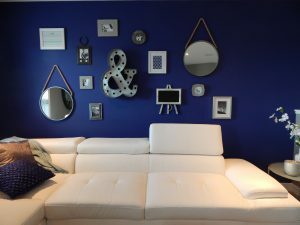 Really, any color can go with blue walls, but depending on the blue, the tone of the blue, and the hue, you will want to determine the color and style of your decorations based on all of those factors. The color of your decor greatly depends on the color of blue you choose, but you can’t really go wrong with white and gold! A current popular color for the walls of a living room is a light green, either with a minty touch or simply green. This color is beautiful, calming, and helps to brighten the room. This classy color can be paired with many different decoration styles to create a living room you want. If you choose an light olive green color, there are many different options that could enhance your living room. A taupe colored couch with a natural wood coffee table could add a rustic and earthy feel in your living room, perfect for the laidback and outdoorsy homeowner. Add different shades of olive green in other decorations, like throw pillows, lamps, or centerpieces. If you are going for a brighter green, turquoise can be the perfect accent color. While that seems like the last color that would match with green walls, it adds a pop of color and a cooler feel. This color combo create a chic style with a beachy look. Greens are also great with white, black, and browns. But one color you may never have expected to add to the green walls of your living room is a rusty orange or dull yellow. These warm colors match nicely with the earthy tones of your walls and add a bold look to your home. 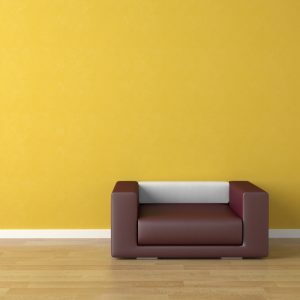 Many people do not even consider painting their wall yellow, but this could be a great addition to your home. A bright yellow, like canary yellow or a more golden yellow, can add a rich look and feel to your home. The best thing about yellow walls is that they can match with just about anything. Find a rug that incorporates the yellow that you painted your walls, red, blue, and green. And now you can easily decorate with all of those colors! While this is easy to do with just about any color you paint your walls, some colors are more challenging to find. Even if you don’t find a rug with the colors you want to incorporate, you won’t have a problem creating the perfect room. Blues with a gray tint are always great accents against a yellow wall. The deep and calming color and soften a bright wall and make the room seem more relaxed. Gray can also do this. So depending on if you want a gray or deep blue couch, it is sure to work well with your yellow living room. There are many different color combinations that can go with any of these colors or any that you choose for your home. We only hit a few bold living room colors for now, but if you are going to make a statement with other colors like red, purple, or dark grays, you are sure to find accents colors that you can decorate with. As we mentioned before, decorations and room colors are becoming more unique, bold, and eye catching. If you are looking for something different to do with your living room, try a bright and bold color like the ones listed above and mix and match different accent colors and decorations to create a room that is truly one-of-a-kind. Life is too boring to have white and beige walls. Mix it up and have some fun with your home with bright decorations and bold paint colors. To give your home the unique upgrade it needs, contact JC Toland Painting. We can help you with all of your painting needs, from interior painting to decorative painting. Give your home a bold new look with a paint color that stands out from the rest. We can help give your walls the best paint job and create a completely new style for your home! Start planning for your bright and brilliant living room today!